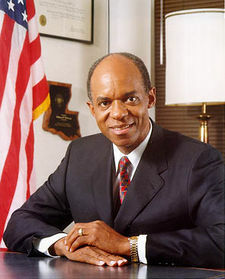 William Jennings Jefferson, known as Bill Jefferson (born March 14, 1947), is an African-American former politician and convicted felon from his native U.S. state of Louisiana. He served as a Democrat in the United States House of Representatives for Louisiana's 2nd congressional district for eight consecutive terms after more than a decade in the state Senate. He is a native of predominantly black Lake Providence in East Carroll Parish. In an investigation of Jefferson's campaign funding, the FBI found "$90,000 of the cash in the freezer, in $10,000 increments wrapped in aluminum foil and stuffed inside frozen-food containers." On June 4, 2007, a federal grand jury indicted Jefferson on multiple charges related to corruption. Jefferson was under investigation by the FBI for corruption since March 2005. He has alleged to have received over $400,000 in bribes through a company maintained in the name of his spouse and children. On 30 July 2005, Jefferson was videotaped by the FBI receiving $100,000 worth of $100 bills in a leather briefcase at the Ritz-Carlton hotel in Arlington, Virginia. Four days later, FBI agents raided Jefferson's home in Northeast Washington and found $90,000 of alleged bribed money in his freezer. On June 4, 2007 Jefferson was indicted on 16-counts in a 94-page indictment that included charges of racketeering, soliciting bribes, wire fraud, money-laundering, obstruction of justice and conspiracy and violations of the Foreign Corrupt Practices Act. Released from prison in October 2017, Jefferson served eight of the thirteen years to which he was sentenced.U.S. District Judge T. S. Ellis, III, of Alexandria, Virginia, ruled that according to a United States Supreme Court decision in 2016 in the case of former Virginia Governor Robert McDonnell, not all of Jefferson’s behavior rose to the level of public corruption. Ellis said that Jefferson will be freed pending a new sentencing hearing set for December 1. Ellis gave the government until October 16 to inform him as to whether federal prosecutors intend to retry Jefferson on the vacated counts and if so, what would be the legal grounds for further action. ↑ Rachel Weiner (October 5, 2017). Judge lets former Louisiana congressman William Jefferson out of prison. Washington Post. Retrieved on October 6, 2017. This page was last modified on 26 September 2018, at 16:31.